While labor force participation increased last month, its 62.9% rate is still near the lowest level in decades.14http://www.politico.com/story/2017/02/economy-added-227-000-jobs-in-january-234598 According to Glassdoor Chief Economist Andrew Chamberlain, approximately 5.5 million jobs remain open in the U.S.—close to a record number.15http://www.forbes.com/sites/maggiemcgrath/2017/02/03/job-growth-beats-expectations-u-s-added-227000-jobs-in-january/#f1b533b7b761 Some of these jobs, such as retail and food service, don’t require much training, but they aren’t always located near where unemployed workers live. Other jobs in the hot fields of healthcare and technology require training and skills that many workers simply do not have right now.16http://www.forbes.com/sites/maggiemcgrath/2017/02/03/job-growth-beats-expectations-u-s-added-227000-jobs-in-january/#f1b533b7b761 As a result, closing the gap between open jobs and willing workers is a complex challenge for employers and job-searchers alike. Rinse the chicken and use paper towels to dry it very well inside and out. Add salt and pepper to the bird’s cavity. Truss the chicken by tying up its wings and legs. Cover the skin with salt and add pepper to taste. Place the chicken in a sauté or roasting pan. Put the chicken in the preheated oven. Roast the chicken for 50 – 60 minutes, until fully cooked. Add thyme to the pan’s juices and baste the chicken with this liquid. 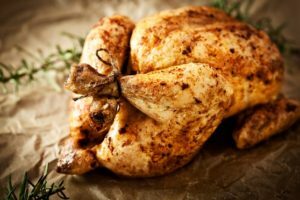 Carve chicken and slather meat with butter. Minimizing tax liabilities is common practice as Americans prepare to file and optimize their tax returns. The exemptions and dependents you claim can help increase your deductions. For the 2016 tax year, each exemption typically allows you to deduct $4,050 on your return. However, taxpayers earning above a certain income bracket will lose all or part of that deduction, so you’ll need to be aware of how your income affects your deductions. Exemptions for Dependents: If you live with a child or relative who is financially dependent on you, than you can often claim them as tax exemptions. You will need to provide each dependent’s Social Security number, so be sure to have that information available. Dependents’ Exemption Limits on Return: Any person that you claim as a dependent on your tax return cannot claim their own personal exemption on their tax return. The dependent cannot claim their personal exemption even if no one claims them on a return. Dependent Filing Requirements: Just because you claim someone as your dependent does not mean they are free from having to file their own taxes. Details such as their total income, marriage status, and taxes owed will guide whether they should file. You can learn more about the rules surrounding claims on exemptions and dependents on the IRS website. Wouldn’t it be wonderful if every round of golf came with still, calm weather? Of course, wind can pick up at any time, and you don’t want to sacrifice your score (or sanity) if it does. Fighting the wind can be tempting, but no matter how strong you are, you’re probably not stronger than the breeze. So, rather than trying to muscle through, follow these two simple tips to hit solid shots when the wind is blowing. Go up a club or two. The key to maintaining your game in a breeze is hitting solid, low shots. By going up a club or two, you can focus on making ideal contact with the ball, rather than trying to hack at it with all of your strength. Swing at 75%. Because you have more club than you’d usually use, you can swing with less force. By avoiding the backspin that often accompanies a fast swing, you won’t send your ball skyrocketing high in the air, where the wind can easily catch it. Playing in the wind is always more challenging than enjoying a round on a clear day. With a slower swing and a stronger club, you will be better able to keep your ball low and straight, and have more control of where your shots land. We all know that getting enough sleep is important, but the side effects of insufficient rest include much more than feeling tired or not having enough energy. Missing sleep can throw off your circadian rhythm, which helps to regulate your brain and body systems. As a result, you may experience a variety of negative symptoms, including increased blood pressure and decreased working memory. Get Adequate Rest. Aim to get a minimum of 6 hours of sleep each night, but strive for 7 to 8, which is a more optimal range. Also, focus on going to bed and waking up at the same time every day. Readjust to Different Time Zones. When you travel to a new time zone, you can throw off your body’s circadian rhythm. Help yourself adjust more quickly by being in bright morning light. Go outside when you wake up, and consider walking for an hour while you’re there. Treat Sleep Disorders. Obstructive sleep apnea becomes more common as you age. This sleep disorder causes you to stop breathing while asleep, and then wake up — disrupting your rest. If you suspect that you or your partner may have sleep apnea, consider talking to your doctor about a CPAP (continuous positive airway pressure) machine, which will help regulate breathing. Swap Liquid Soap for Bar Soap: Liquid soap is harming the planet. Producing liquid soap uses 5 times more energy for raw materials than bar soap and 20 times more energy for the packaging. By switching to a bar, you will also use nearly 7 times less product, decreasing your consumption impact. Wash Laundry and Run Dishwasher at Night Instead of During the Day: Every time you run the washer and dryer or the dishwasher, the machines create heat and humidity, causing your AC to pump harder in warmer months. Try washing items during off-peak hours, typically after 8 pm. You can also go a step further and hang your clothes to line dry or use low dryer settings. Replace Coffee Pods with Traditional Coffee Maker: The #7 plastic used in each coffee pod container is often not recyclable. As a result, every single pod not recycled ends up filling our landfills. With billions of coffee pods sold each year, switching to a traditional coffee maker can make a huge difference in limiting your environmental impact.